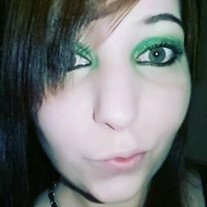 Faith Lynn Greenway, 28, passed away Sunday, March 11th, 2018. She was born February 4th, 1990 in Searcy, Arkansas. She loved being a mother and taking care of her two girls. She was a devoted mother and an amazing wife and best friend. She was preceded in death by her mother, Kelli Martin; and her paternal grandparents, Troy and Mary Martin. She is survived by her maternal grandparents, David and Linda Lawrence; her father-in-law Sam Greenway; her mother-in-law Liana Greenway; her husband of 10 years, Shawn Greenway; her two daughters, Trinity Noale Greenway and Lettie Lina Brooke Greenway; her sister Sarah Kay Felton; and several aunts, uncles, cousins, and friends. Visitation will be Friday, March 16th from 5-7 PM and the funeral service will be Saturday, March 17th at 2 PM both at Willis Funeral Service. Burial will follow at the Pleasant Valley Cemetery of Cushman.